While many astronomical images show nebulae that are illuminated by the light from nearby stars or star clusters, this image shows an entirely different kind of reflection nebula. Surrounding our Milky Way galaxy are large clouds of dust, hydrogen, carbon monoxide, and other elements that have been ejected from our galaxy. The clouds are not illuminated by stars, but are illuminated by the entire light of the Milky Way Galaxy. Because of this, they are known as the Integrated Flux Nebulae or IFN - meaning that their light comes from the combination of all the light from our galaxy. These clouds are mostly visible at high galactic latitudes - those portions of the sky that are well outside of the plane of the Milky Way. We see very large portions of the IFN in the regions towards the north near Polaris and other circumpolar constellations. This image shows the IFN known as the "Volcano Nebula" or MW3 (Mandel-Wilson Catalog of Unknown Nebula #3). This nebula appears in the direction of the commonly photographed galaxies M81 and M82, both of which are featured at the center of this image. The IFN is extremely faint, and I have processed this image so as to brighten this faint nebula to show it better. Also shown in this 5 1/3 degree by 3 1/2 degree field of view are several other northern galaxies. 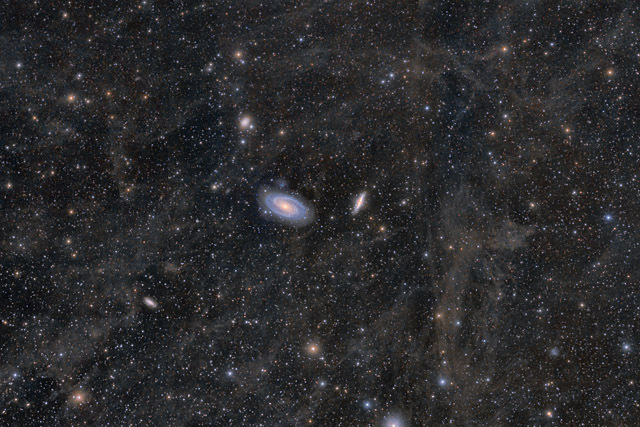 Immediately above and almost touching M81 is its satellite galaxy, Holmberg IX. Above M81 and M82 is the Seyfert galaxy, NGC 3077. It is a member of the M81 group of galaxies. 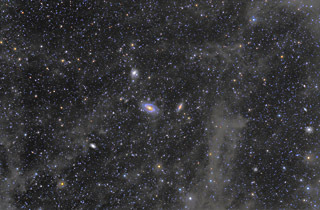 To the lower left of M81 is NGC 2976, an unbarred spiral galaxy. I had previously photographed this field of view in 2013 using my 200mm lens. While I was very happy with the result, I wanted to see if I could improve upon that image. With this version, I used my 600mm lens, and made a mosaic of 5 panels. While processing this image, I made a point of trying to retain more details within the faint IFN, while also trying to bring out the subtle colors within the nebulosity. Software Used Images Plus 6.0 for camera control, Images Plus 6.5 for calibration, stacking, color channel splitting and recombination, normalizing, ArcSinH stretching, star size reduction, edge masking, and masked stretching. Photoshop CS5 used for levels and curves, high pass filter, screen mask invert, lab color, saturation adjustments, selective color, and match color. Gradient Xterminator for gradient removal. Carboni Tools for additional noise reduction and smoothing. HLVG for additional color correction. Registar 64 for subexposure alignment, color channel alignment, mosaic normalizing. Pixinsight 1.8 for Gradient Merge Mosaic. Focus Magic for focus restoration. Notes I was always quite happy with my earlier 200mm version of this image. However, the lack of color in the nebulosity bothered me, along with some of the loss of detail I had. I feel very good about this newer version, as I think it shows that I've been able to develop better techniques for bringing out these very subtle nebulosities. This image represented some significant challenges. First, being a mosaic is always more difficult. However, the problem of matching up the panels in a mosaic become even more dramatic when you have to stretch the data as aggressively as I did in this image. Any slight mismatch in the early mosaic combining will show even worse when the faint background is brightened. I'm very happy with the final result in this regard, as the seams of the mosaic are virtually invisible. While this image is far from perfect, I think I was able to achieve a good balance between bringing out the IFN while maintaining reasonable noise levels. I wish I had more data for each panels, but a long winter of poor weather stretched these 9 nights of imaging too late in the season to gather much more. Besides, I was tired of photographing the same field of view! This image was also published in the April 2017 issue of Sky and Telescope magazine in their article entitled "Herschel's Ghosts" (p. 35)!! !